Think healthy fudge is an oxymoron? Not true! 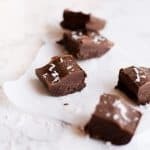 This Dark Chocolate Coconut Oil Fudge is naturally sweetened, dairy-free, vegan, and packed with nutrients and healthy fats. Line a small square dish (I use this small square glass food storage container—it’s perfect for this batch size) with parchment paper. Set aside. Pour mixture into the prepared dish. Refrigerate until solid, about an hour, then sprinkle the shredded coconut on top, and cut into 9 small pieces. If you’re in a hurry, pop it in the freezer and you’ll be ready to go in about half the time—although you might need to use a knife run under hot water to cut through it. I don’t recommend making this any of the “regular” size baking pans, because the resulting fudge will be very thin (this is a small batch recipe). I like using a small square food storage container. If you happen to have a mini muffin tin, you can also use that for pre-portioned fudge bites.